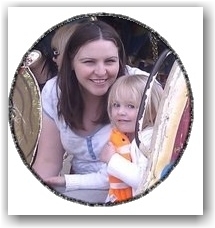 Today's guest post is from the lovely Rebecca of Here Come the Girls. Rebecca is one of my co-hosts on The Sunday Showcase and I am so happy to have her sharing here today. She has a fabulous DIY Writing Table idea to share with you (I LOVE it!) but before we get to that I wanted to share a few of my favorite posts from Here Come the Girls. Rebecca recently shared a Fairy Fun round-up of all kinds of fabulous fairy themed ideas. There is so much there I know my girls would love to try. You know I am always trying to come up with fun ways to learn so when I spotted this Glitter Writing post - I was so excited. Can you tell she is Mommy to 3 girls? She definitely knows how to have fun with her girls! Now, I turn you over to Rebecca and her fabulous (and easy) DIY Writing Table. My eldest has just turned five and is becoming a bit of a mini-me where writing is concerned. She likes nothing better than to sit and write letters to people. Most of the time she doesn't let me look at the letters she is sending. Although I did get one sneaky peek at a letter to a school friend which went along the line of, "Dear John, I really wish you would be good. You should try not to sit on the thinking chair. I hope you will not be naughty." Hmmmmm..... maybe she's destined to follow me into teaching as well. Our problem was that although she had lots of things to write with she had no where in the sitting room to write. She could go in the dining room but she hates to be in a room on her own. So I decided to make her a fun writing table with all her writing materials on it so she could do homework or some writing whenever she wants. We had an old Ikea table which had seen better days. I forgot to take a picture of it but it had a few stains on it and one part was a bit cracked but other than that it was fine. I enlarged lots of photos and printed them off in black and white. I want to be able to change the photos regularly so I stuck them down with a small piece of blue tack. I covered the whole surface of the table with pictures. I added letter and number stickers for the girls' names and the alphabet and a small number line. Over the top of the pictures I put the clear plastic. I bought this from a shop which sells laminated table coverings. I folded the edges down and used a gun tack to secure them. The staples need to be tucked under the table out of reach of little fingers. The girls get so much use out of it and I'm really happy with how it turned out. Another plus, it doesn't matter if they get marker on it because it washes off so easily. Here are the girls getting down to some writing. It's also perfect for doing jigsaws. Of course the best thing is I can change the pictures whenever I want. Next time I might use some coloured animals or one of their favourite cartoons. Anything which gives them something lovely to look at and encourages them to sit down and enjoy a few quiet minutes, with a bit of learning snuck in is wonderful. Rebecca is a teacher turned stay-at-home Mom to 3 beautiful girls (a four year old and one year old twins) and blogs at Here Come the Girls which is full of crafts, cooking and learning. Thanks for having my guest post and for your write up. So lovely to get such a nice recommendation! Thanks Cerys - it gets used so much. Oh what a great idea! I think I'd cover mine with comic book pages and see if they inspire some superhero adventure stories! Oh my husband would love that - he's a bit of a comic book geek. I might have to do it next to surprise him. Love this! I especially love that you can easily change the photos out. Yes it'd be good to put some of their favourite pictures next time. Lovely idea! Looks like everyone is having fun and learning too. Family photos are so important to develop a sense of belonging. It turned out how I hoped - doesn't always happen with crafts! So cute! I love this idea!! Nicely done. To think that this was just a DIY table, you've made it look like you bought it out of a store.